American Farmland Trust published its Women for the Land program report, “Testing the Women Landowner Conservation Learning Circle Model.” The report, along with illustrative profiles and videos, further supports previous research that lady landowners are important in the broader implementation of conservation practices on farms. The interviews also show women-only learning circles work as a means for expanding conservation actions and that women who participated want to learn more. Nearly 301 million acres of U.S. land — about a third of the nation’s land in farms — are now farmed or co-farmed by women, and at least 87 million additional acres are in the hands of women landowners. Research shows many women farmers and landowners have a strong conservation and stewardship ethic. They are deeply committed to healthy farmland, farm families, and farm communities. However, women face gender barriers affecting their ability to manage their land for long-term sustainability. And while women increasingly are the primary decision makers on farms and inclined towards conservation, they are underrepresented in use of USDA conservation programs. To help address these issues, AFT launched Women for the Land. 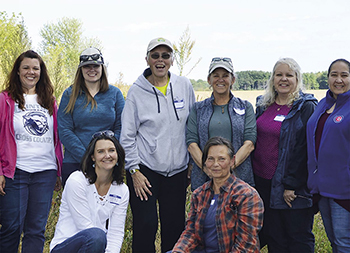 Inspired by the Women, Food and Agriculture Network’s Women Caring for the Land program, the initiative includes women-only learning circles designed to break down gender gaps and expand women landowners’ knowledge and confidence. Between 2014 and 2017, AFT, WFAN, and USDA’s Natural Resources Conservation Service facilitated 13 learning circles in Illinois and 31 in Indiana. In the works are materials to help landowners “start the conversation” with their farmers and vice versa. AFT learned some women are hesitant to talk to their tenant — most all of whom are male — as they don’t want to imply that he’s not a good farmer. They view the farmer as the expert. And, on the farmer side, these conversations can cause him to fear he will lose the land to another tenant. Providing a tool that helps to address these questions and move forward together, AFT believes, will facilitate more productive conversations. AFT is also expanding the program to additional states — currently running learning circles in Maryland, Pennsylvania, Virginia, Ohio, and California. To identify regional differences and plan for further expansion, AFT is conducting a survey of non-operating landowners across 11 states where there is a high percentage of rented land. AGDAILY develops smart, engaging, and innovative content for production farming and rural living. We're the information superhighway for your country road.